Thank you so much to all of you who have made kind offers of backpacks and panniers for me to borrow for my trip. After some experimenting, I really think I’m going to be able to get everything into the pack I’ve got. For those who suggested panniers, there’s actually nowhere to mount them on my bike. They warned me about that when I bought the bike so I’ve been training myself to carry a fairly heavy pack. I did break down and buy a small handlebar pack the other day. I can fit a tube, a bunch of nutrition bars and my keys in it. It also had some thing that I obviously need, a clear map sleeve that I can read while I’m riding. I am headed out tomorrow at 4am for the Providence Zen Center. This is a bit of a dry run for the trip down to the same place for my retreat next week. It is Founder’s Weekend at the PZC so I’ll be going down tomorrow and back on Sunday. If I’m too tired to ride Sunday, I can always take the train back from N. Attleboro. I’m looking forward to it. It shouldn’t be too difficult a ride since I don’t have to bring very much with me. For those of you who may be worried, I have someone to call if I have any trouble on the road as well as several maps, flicky-lights for and aft, two water bottles and a list of bike shops along the way should I experience technical difficulties. I also got a chance to use the handy dandy bike cleaning kit that Patience gave me for Christmas last year so the bike is gleaming, oiled and ready to go! So enough with the bike talk! This is a knitting blog right? Well, there has actually been some knitting this week at Chez FullService. Is it the Zen Master’s sock? No. Jess’ sweater (though I am up to the armholes)? Nope. My niece’s cardigan (all the pieces done but still not sewn up and edged)? Of course not. It is this! This is a sock I’ve started out of the last of the sock yarn that I got on a trip to Camden, ME over the winter. It is made of Trekking XXL (does that mean I’m participating in the Trek Along??). 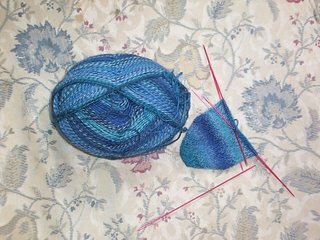 I started it as a computer sock (something to knit while I was waiting for my old dial up connection) but since I’ve gotten DSL, I don’t seem to be working on it any more. Well, I fished it out of the computer area the other day and have been happily knitting on it. I’ll probably be good and take the Zen Master’s sock with me to PZC this weekend. I’m about half a sock away from glory on that one so I should just get it done! The shop will be covered tomorrow but the lovely and talented tag team of Susan and Kimberly. Have a great weekend and, if you’re in Porter Square, stop in and say hi to them! I WANT MORE BABY PICS!!! Oh, does that mean you took the plunge? Er, the cut? It would be perfect in this weather, that's for sure.